The facade's materials reference the adjacent 19th century opera house and a new public plaza was created between the two buildings. The building is reinvigorating a depressed downtown core ravaged by the economic displacement to big box stores on the outskirts, and adding to their architectural legacy with a design that expresses contemporary ideas while also acknowledging the past. The new Orillia Public Library and Market Square dramatically refresh downtown Orillia. The library’s fritted glass facade shimmers in the sunlight — a delicate counterpoint to the weighty red brick piers of the adjacent, Victorian Opera House. 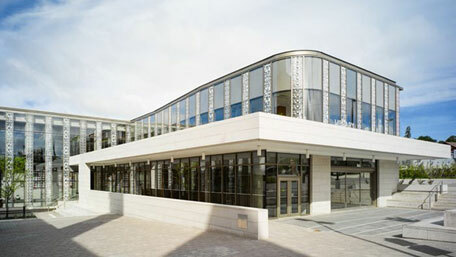 The library’s windows, decorated with syncopated, vertical bands of foliage, add surprising decoration to the otherwise clean and contemporary building. a proud history, to construct a new building that would complement its nineteenth and early twentieth century neighbours. The new Orillia Public Library and Market Square dramatically refresh downtown Orillia. The library’s fritted glass facade shimmers in the sunlight — a delicate counterpoint to the weighty red brick piers of the adjacent, Victorian Opera House. 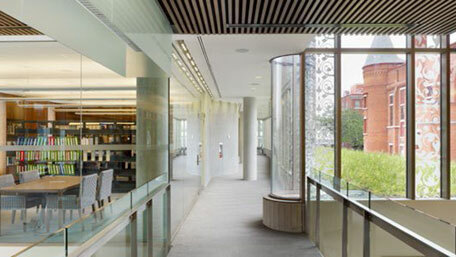 The library’s windows, decorated with syncopated, vertical bands of foliage, add surprising decoration to the otherwise clean and contemporary building. This ornamentation stems from the town council’s desire, as is typical of many regional towns witha proud history, to construct a new building that would complement its nineteenth and early twentieth century neighbours. Full press release and photo gallery.